Select the drop down menu under your username and select "Folders"
Option 1: From one of your saved lists, select one or more pieces of data to file and then click "File to Folder." Option 2: From an item's detail page, select "File to Folder" from underneath the Title. 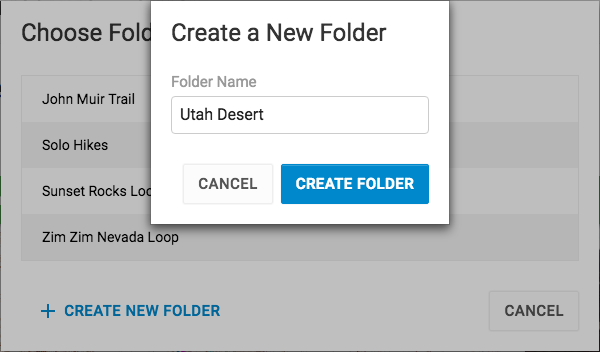 Next, select an existing folder, or click "Create New Folder" to create a new one. Name your folder and click "Create Folder" to save. 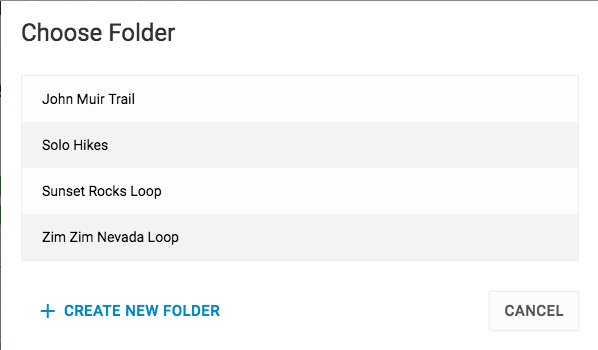 Note: You can create subfolders by filing a folder into another folder. Keep in mind that subfolders cannot be filed into multiple folders. I would like to be able to upload several different related files into one folder, but is there really no way to do this?! When I upload several .gpx files and specify the same folder name for each upload, it creates several folders all of the same name, each containing one file/track. I would expect it to upload several files into one folder, as the whole point of a folder is to group things together. If I don't specify a folder name, it places the file in its own folder anyway, named after the file name.They all get their own folder, which is really not helpful. Also, you can't MOVE the file out of its initial folder into a new one. Also, the upload feature only lets you select one file at a time. I have wasted a lot of time trying to figure out a way to get this feature to work as expected, and the help file does not help. I am on a Mac, and my use case (which I think is pretty common) is trying to upload a large route that has been broken down by the route organizer into several different .gpx files. Is there another way to manage this situation? I'm sorry for the frustration. I agree this would be a helpful feature to have on gaiagps.com and we have an internal feature request to improve uploading files to existing folders. Thanks so much for the kind response Nathan ^! That does help a lot for now. I love using Gaia maps in general, and would love to see it get even better. I have been playing with the app and figuring it out, but I cannot figure out how to get waypoints to show up from my imported maps I’ve had air dropped to me. In the saved area it show the track has 49 waypoints but they are not visible to me. I’ve made sure that waypoints are enabled and air dropped them multiple times. Any suggestions? I'm sorry you are having an issue viewing the waypoints associated with your recent imports. Can you click “Submit a Request” above and include a copy of the imported data so we can take a closer look? I agree with JulieKanagy's request to be able to upload gpx files into an existing folder. I can, and do, move them to another folder after uploading them, but haven't figured out a way to delete the folder that was created as part of the upload. I now have a bunch of empty folders that were created by gaiagps.com as part of a file upload that I have to sort through on the "choose folder" list when I want to sort my tracks. Is there a way to delete a folder? I can delete it on my phone (android), but the deletion doesn't seem to "stick" on gaiagps.com. If there's no such way to delete a folder, consider it a feature request! Thanks. 3. Click delete in the top menu bar.